Using a hammer to drive a nail into the wall or a piece of wood can be a total energy drain - mentally and physically. Hitachi global nail guns can do the trick. With years of experience in the manufacture of power tools, Hitachi global can be totally relied upon to make your choice of a nail gun worth the money. Hitachi Nail guns are made based on different criteria like the length of the nail and the mechanism that is involved. Hitachi global make corded as well as cordless nail guns. 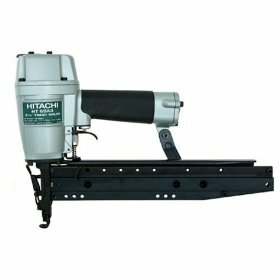 Framing nailers and finish nailers and roofing nailers are also manufactured by Hitachi global nail guns. Their working can be based on principles like for instance gas framing and finish nail guns which contain gases like butane, etc. A jet of pressure exerted by the expanding gas when the trigger is pulled drives the nail straight into the wall. The pressure can be adjusted depending upon the length of the nail and the thickness of the nailing surface. Hitachi global nail guns come in 3 series, namely NR, NV and NT with the NR series containing the cordless models. Most NR models are light in weight with a good balance but are only moderately tough. An attachment at the rear to hang on the wall or back of the door can be an easy put away. Jamming does not seem to exist with Hitachi global nail guns even while pinning three and a half inch nails into thick oak walls. Loading is easy as the pull back is large. Sometimes smaller nails are successively skipped which may require the user to manually pull out every nail individually. But don't dare lay your hands on these nailers without having your safety glasses on unless you want small splinters of plastic from the strip flying into your eyes. Roofing nail guns are a part of the NV series known for its consistent performance and easy mechanism of reloading the coils. They are durable to the extent that even repaired pieces last for a year and a half of everyday usage. Easily adjustable 'depth of the drive' controls work accurately irrespective of the nailing surface. Except for occasional misfiring, jamming and sometimes two nails being shot at once the NV series is a solid option if you are looking at roofing nail guns. Unshakably trusted for its negligible recoil and light weight, the NT series finish nailers seem to hold the most of Hitachi global nail guns' customer base. The air blower feature found only in the NT series helps blowing away any withering plaster or dust. With absolutely no misfiring and plenty of power to even effortlessly pin pressure treated fir, The NT series is worth the money in every meaning of the phrase. The nails of Hitachi global nail guns come with larger heads making the firing more exact. Switchable fire modes are another Hitachi nail guns exclusive. Hitachi global is close to 'unbeatable' when it comes to nail guns!! Return From Hitachi Nail Guns Page to Home - Finishcarpentryhelp.com.